to a REAL tasty tuesday…..
…there was that super salmon inside…. 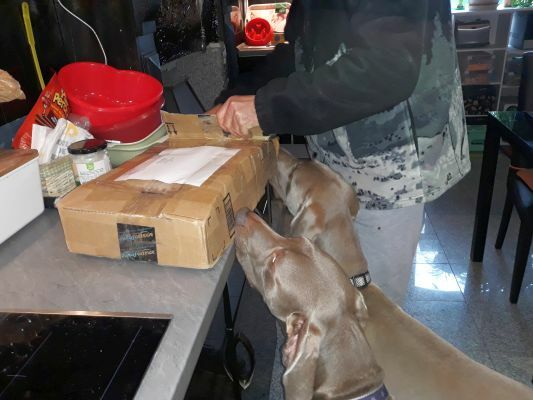 Posted by easyweimaraner on January 29, 2019 in animals, award, balls, Blogville, Braque de Weimar, cats, chien, cooking, Crime, DIET, dogs, endless wisdom, Family, food, pets, weimaraner, weimaraners, writing and tagged Animal, backyard, Bloghop, Blogville, Braque de Weimar, Brittany, diet, Dog, dogs, Easy Rider, endless wisdom, Family, fresh style, pet, pets, Weimaraner, weimaraners. Oh WOW! You lucky things! Oh WOW! Some real salmon huh? Now that was a totally tasty and thoughtful present indeed AND your Mom didn’t have to put any words on the crust because she knew it would be delish!!!!! YAY!!!!! Salmon is good for you and makes you smart and gives your furs a shine too. Imagine 3 cats sending 2 dogs salmon…I get the kit kats had no idea their salmon was leaving the house. That was very sweet of them to send that wonderful yum your way! Amazing! Sounds like everyone finally had a good food experience! My mom won’t stand for any fish, but we like fish. 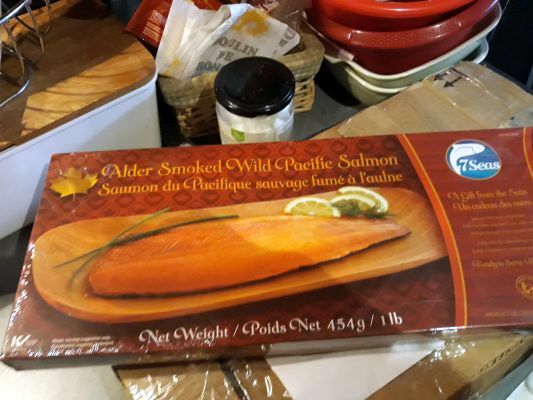 That smoked Pacific salmon is the best I know, I love it! That was super nice of them. It looks dee-lish to us! What a SuperDuper pressie and a yummy one at that! Real salmon – a beautiful dinner. Brings out the call of the wild when you wolf it down! Perhaps the markets of St Pierre et Miquelon would have good salmon for you? Wait, YOUR furiends sent you salmon, and your pawrents hogged it all for themselves?!?! How rude! What a tasty pressie you all got. Too bad your pawrents ate most of it and didn’t share more with you boys. That salmon looks delish! It was very kind of the Canadian Cats to send it. I am glad you got some to taste although I think you should have had an equal share. Who says the mama isn’t a great cook! This looks yummy! You pups are lucky you got some! 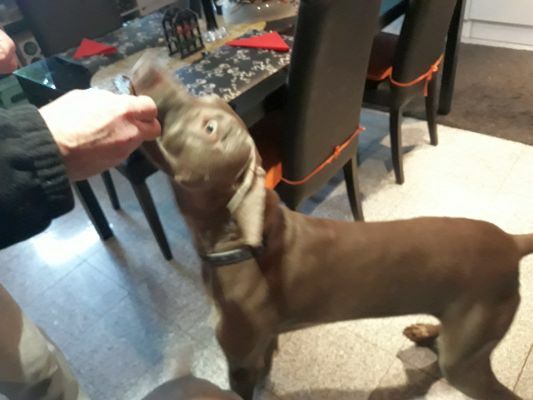 Next time, there should be a salmon fillet just for the handsome weims….just sayin’. Nothing better than salmon!! Bentley gets some mixed with his dinner sometimes. We humans love it!! 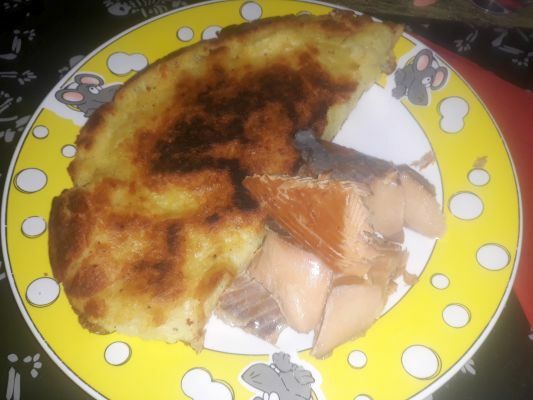 Mom and I don’t eat salmon, but we googled roesti and OH YEAH! We are on board with that. We’ve never met a potato we didn’t love. oh my!! Salmon from Canada!! nothing better than that! That looks so delicious in the photo. We love salmon so much but that piece looks to be just perfect. Thanks for sharing the wonderful photos. Hope it was delicious for everyone. What a great present! Looks quite yummy! Wow, a salmon from Catnada?? Now that’s a Tasty Tuesday for the whole family. You have the best friends! What a great present from your Canadian friends! Salmon – our favorite fish!!! Dad doesn’t like salmon:( So the Momster doesn’t buy it often, but at least a lot of our canned food and treats have salmon in them. Oooooooooo! 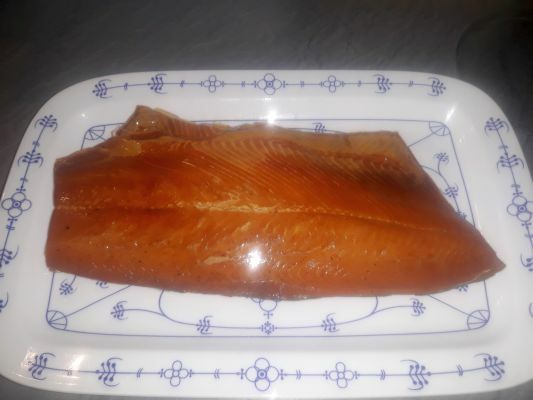 Smoked Pacific salmon is the best! MMMMMMMMmmmmmmmm salmon!!! Yore so lucky Phenny an Neilson!! What a super treat from your friends! Oh yum. That looked delish!